Looking for Clear Braces in Huntington Beach? Dr. Dang is a Preferred Provider for Invisalign®. Huntington Beach Invsalign® dentist, Dr. Titi Dang, DMD of Pearly White Dental knows how important it is for her patients to have beautiful, straight teeth. Traditional teeth-straightening treatment involves the use of metal braces that are uncomfortable and contain metal wires, which aren’t aesthetically pleasing and can hurt the inside of your mouth. Invisalign® and Invisalign Teen® from Pearly White Dental gives Dr. Dang’s patients straight teeth by using a clear tray system that is nearly invisible, and is custom-fitted to comfortably fit your smile. Invisalign® is also removable and can be taken out by the patient for special occasions and routine teeth cleaning. • Comfortable – Invisalign® does not contain metal pieces that can cut or scrape the inside of your cheeks. 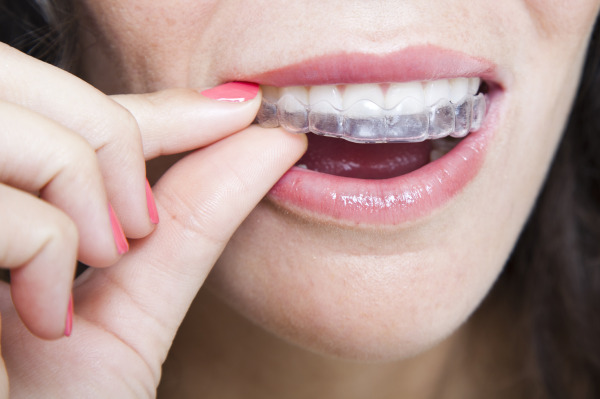 • Nearly Invisible – Because the trays are molded to perfectly fit your smile, and are made of a sleek thermo-plastic material, it will be difficult for others to tell that you’re wearing an orthodontic appliance. • Easy to Clean – Food can become stuck in brackets and wires, which are difficult to clean around, but Invisalign® is removed during meal times and can be gently brushed with a toothbrush, if any cleaning is necessary. While Invisalign® may differ from metal braces in many ways, the one area of overlap between the two is typically the cost. Many patients are surprised to learn that the cost of Invisalign® is comparable to the average cost of metal braces. For complete information on dental insurance coverage and treatment plan costs, it’s important to speak to both your insurance provider as well as Dr. Dang and Pearly White Dental’s office staff. Before beginning your Invisalign® treatment plan, Dr. Dang will conduct a thorough, no-cost consultation that includes a computer imaging mock-up of how your teeth will shift into ideal alignment throughout treatment. Dr. Dang will advise you to wear your aligners for a minimum of 22 hours a day, to ensure best results. Dr. Dang has been a Preferred Provider of Invisalign® in Huntington Beach since 2009 and is happy to show you how you can comfortably achieve a beautiful and healthy smile with this revolutionary treatment. Pearly White Dental even offers 18 months of interest-free financing for Invisalign®, so your treatment is easy all-around. Contact Pearly White Dental of Orange County today for a consultation to see how Invisalign® can help you achieve the smile you have always wanted.